Each week I will go over 1 of the 11 propositions that will be on the California Ballot in November. Today’s post goes over Proposition 31. Are you ready? Let’s go! This proposition changes how the government operates at the state and local level. It gives the governor more power to balance the budget when the legislature is at a stand still. It limits the Legislature’s the ability to add further spending unless they are able to make cuts or transfer revenues from other programs. It also requires state programs to be more transparent, show efficiency and achievement of goals..basically to able to prove that the program is worth spending money on. Finally this proposition gives more power to local governments (cities, counties, school and special districts) in how they spend state funds and administer state programs, but at the same time holding them more accountable to the public. LOCAL GOVERNMENT Gets more control over state programs.. This part of the provision allows local governments to develop new “Community Action Plans” on how to provide state funded services to the community. These plans can be tailored towards local needs and governments can also decide how property tax revenues are allocated (it doesn’t change how much property tax $$ is received..just how it is spent). However, they have to be more transparent and have the approval of the majority governing body. If local governments do put forth a new plan, they will be able to receive a larger share of sales tax revenue from the state. NEW RULES on how the State Legislature passes bills.. Currently the Governor and State Legislature approve how to spend money from the General Fund. The General Fund pays for state expenditures in education, prisons, health and other programs. A majority vote is required by the State Legislature (House and Assembly) to approve the budget, but a 2/3 vote is needed to increase taxes. Sometimes when the legislature is making new laws, it costs money in order to implement those laws. 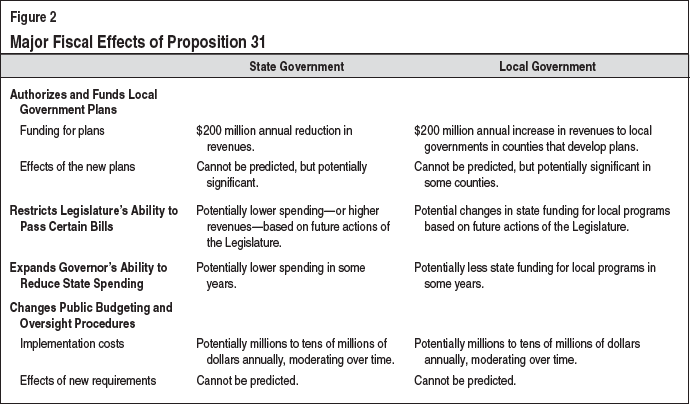 Proposition 31 would require that any new laws adopted that would increase spending by more than $25 million (such as adding a new government department, like”Department of Hollywood Entertainment Regulation”–> silly made up example), would have to be accounted for by cutting and/or an increase revenues by raising taxes. On the other hand, if a new bill would decrease state revenues by $25 million..like say they reduce the sales tax, the Legislature would have to explain how they can recoup the funds or show that they will reduce spending. For example, if Legislature decides reduce sales tax, then they would have to say they are going to stop spending money on “Visit California” commercials.. ( another silly made up example I have no idea who pays for those commercials). Finally, Proposition 31 would require that changes to a bill or adoption of the bill be made available to the public three days before coming to a vote. THE GOVERNOR gets more power to cut.. There may come a time when we are in a financial crisis. Let’s say ..we thought we were going to get a bunch of money, but that doesn’t pan out.. After the budget has passed, the governor is allowed to declare state of Fiscal Emergency, and propose to the Legislature that we cut spending. Currently, the Legislature can wait 45 days then respond, yay or nay. 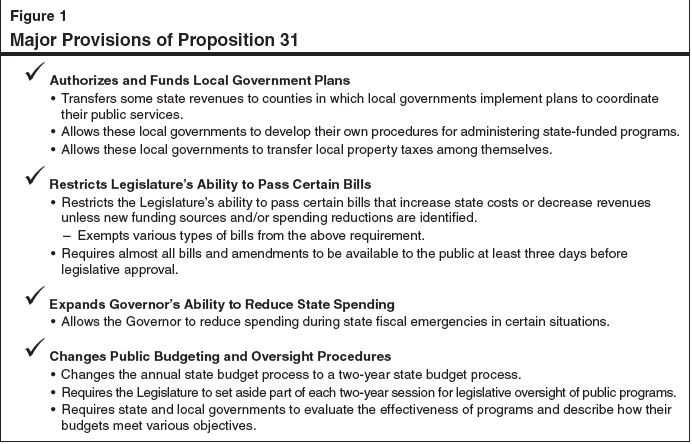 Proposition 31 would allow the governor the ability to cut programs in order to balance the budget. He couldn’t totally cut spending required by Federal Law..like most education, pension and health and social services, and he would only be allowed to cut in order to balance to the budget. The State Legislature could over-rule this but it would require a 2/3 vote. WAIT..IS THIS PROGRAM even working?? This section actually overhauls budget and oversight procedures. First, Proposition 31 asks that instead of the Governor submitting a budget proposal once a year, he/she submits a proposals for each year ..but every two years. For example, starting in 2015, the governor would propose fiscal budgets for 2015 and 2016. Then in 2017, the governor would propose budgets for 2017 and 2018..and so on. However, in between times.. he would send a budget update. For example for the 2015-2017 time period he would send an update in 2016. Second, Prop 31 wants to make sure that the Legislature sets aside a specific time period to analyze state programs, and that during that time period they can not pass new bills, unless the bill takes effect immediately, or is designed to override a Governor’s veto. Finally, 31 would require that state programs be analyzed for effectiveness and if their budget meets program objectives. Meaning don’t allocate 1 million to upgrade parks when 75% of the money is spent on administrative costs. (Made up example, I don’t know if that actually happens). Did you know that The San Francisco Chronicle (www.sfgate.com) is posting pro and cons opinion blogs on their website for each of the propositions? Well now you do! Here is an excerpt of each..
“For more than a decade, the state has balanced its budget with short-term gimmicks and illusions that have masked a growing problem: our state’s ever-widening structural budget deficit. The pro argument was written by Cruz Reynoso and he writes..
requires that the state budget and laws be available to the public for input. The guest blog author, Sarah Swanbeck, lists the following problems..
allows the Governor to cut important fiscal programs during an emergency! Like K-12 school programs, or health care services.. something Governor Schwarzenegger did as a blue item veto when he left office. That had really devastating effects to child care programs. does nothing to curb the state’s tendency to borrow in order to pay for long term programs. Our state does need to work on making sure it’s budget process is transparent and efficient, but do you think this is the right way to do it? Do you have strong opinions about this bill? Share!